As crazy as it might sound, there are actually benefits to freezing weed, and this is a very popular practice among commercial and home growers Read on to find out why they do it. A lot of growers freeze their weed after a harvest so that they can preserve it. This is especially common among outdoor growers who only harvest biannually or seasonally. The most popular type of container used for his purpose is a Kilner jar, which when placed in a cold and dark area, will keep anything well-preserved for almost two years so it’s a good choice for frozen cannabis. That said, there are more advanced freezing methods available for growers with larger harvests. First, it’s important to trim the flowers after harvest and allow them to slowly dry afterward. Next, pack your flowers and buds inside a container with a static charge like a vacuum jar. Check to make sure that it’s sealed shut and then put it in the freezer where you can leave it for up to two years. 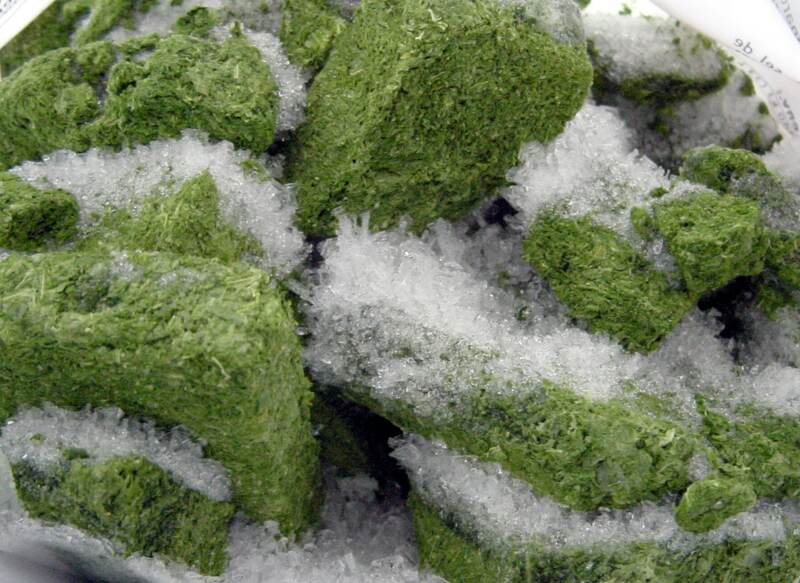 When you’re ready to use the weed, take it out of the fridge and allow it to thaw naturally. Don’t use microwave defrosting! To make “quick hash” (see what we did there? ), simply throw some sweet leaves into a bucket and toss some dry ice on top. Whenever you’re working with dry ice it’s important to wear gloves otherwise you might find yourself without fingers, like seriously. Now, shake the bucket to ‘stir’ the sweet leaf trimmings and dry ice together. Through a process known as sublimation, the dry ice will naturally pull the trichomes out efficiently. Lastly, sieve the mixture to leave behind pure hash powder which should be in a nice blonde color. What we love about this method is that it literally takes minutes to finish and the end result is superb! Ice hash is very special, so it’s important that you get it right. To make it, you’ll need to have a multi-bag kit as that’ll enable you to get a wide range of different grades. A handheld whisk will also be helpful in mixing everything together, which will be followed by rinsing the trichomes out manually. Afterward, they’ll automatically fall onto the micron sheen bags. For a mess-free process, you can opt for a piece of equipment like the Bubbleator B-Quick, which will streamline the process so that there’s less work for you to do except for adding the ice water and weed. Does freezing make weed stronger? The process of freezing fresh flowers is a common practice among U.S. extract artists, and they use cryogenic freezing methods for it. Afterward, they usually use BHO extraction procedures to produce a live resin concentrate. For example, to create a product like Live rosin which has a dark potent hue, you have to convert the flowers into bubble hash and then freeze dry them for 24 hours in an industrial freeze dryer. Next, the extract artist will use a resin press to convert the dry bubble hash into actual live rosin. Obviously, this particular process is best left to the professionals as it requires professional expertise and the right equipment. Should I Keep My Weed In the Freezer? Next PostNext Can Topical Cannabis Be Used for Burns and Wounds?